Whirlwind sunglasses are a classic 7eye by panoptx frame with a sleek design and detachable air Shield foam cup. Air Shield technology forms a Shield around the orbital socket of the eye to lock in moisture and block out wind, dust, pollen, and air-borne irritants. The wide lens offer panoramic view for the ultimate performance in any outdoor activity. Whirlwind has a slip-proof rubber temple pad and its rubber-sealed eyecup (latex-free) is both sweat-resistant and durable. 7eye by panoptx sunglasses are suited for adventure sports - motorcycle, ski, glacier climbing, parasailing, paragliding, and more. These sunglasses are also great for those suffering from dry eye. Whirlwind is best for s-l faces and is available in both a glossy black and dark tortoise frame with multiple lens options. 100% UVA protection. Includes zipper case, microfiber bag, leash, and sticker. 7eye photochromic day/night eclipse lens is the fastest color-changing lens in the market. This lens starts off clear and darkens to gray in bright conditions. 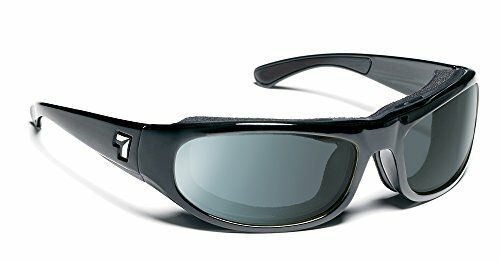 These lenses are tapered and de-centered to provide you brilliant clarity and glare-cutting capability. If you're looking for a functional lens which adapts to your environment, this is the ideal lens especially for motorcycle riding. If you have any questions about this product by 7eye by Panoptx, contact us by completing and submitting the form below. If you are looking for a specif part number, please include it with your message.